Anger against America is already on top in Muslim world specially Pakistan due to policies of US Governments and invasion of Muslim countries one after another. Hatred against America is growing in Pakistan day by day due to Drone attacks which killed many Civilians and attacks like Salala in which Pakistani soldiers where killed by Nato Troops. My recent observation shows that People of Pakistan are also very angry at US secretary of state Hillary Clinton. the reason for this anger is Statements of Hillary Clinton against Pakistan during her recent visit to India this week in which she blamed Pakistan and also said Zawahiri is in Pakistan. 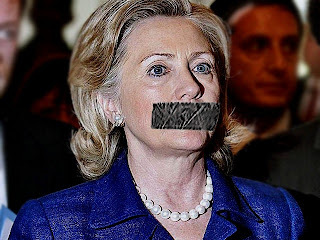 after statements of Hillary in India the word #Shutupclinton trended top in Pakistan on Twitter for almost two full days. Messages like this where also circulating in Pakistan on Social networking sites "Mrs.Clinton didn't know Monica was in her hubby's bed but is damn sure Zawahiri is in Pakistan!". So all these are signs that hatred against US is growing in Pakistan and US needs to see again its foreign policy to change the present Situation.